Audition Salamander A/V Furniture in our Raleigh Showroom. We have several Salamander Designs pieces on display. 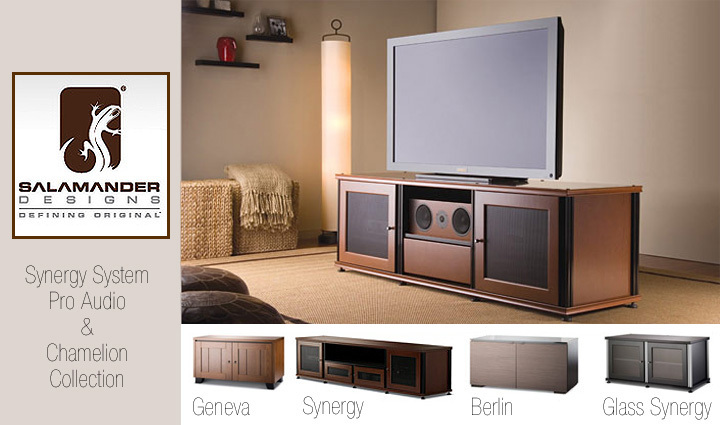 Salamander Designs builds very high quality, versatile and functional audio/video furniture. The Synergy System can be built in several finishes and hundreds of configurations. The Chameleon Line offers many different styles that blend into your decor better than other A/V cabinets, while maintaining it’s functional integrity for housing audio/video gear. Most Chameleon cabinets can be mounted to the wall for a floating built-in solution. We are Authorized Salamander Designs Dealers. Visit our Showroom and See Salamander Designs for yourself! Salamander piece is the right choice for you and your application.